The Zone Diet is all about maintaining the right balance and giving your body all of the nutrients that it needs to thrive while losing those extra pounds. But it’s also all about not restricting yourself too much, so it should come as no surprise that there are so many Zone diet approved desserts to choose from. Check out the 12 dessert options below that you can enjoy shamelessly while following the Zone Diet, and go ahead and dig in! 1. Banana Pudding that consists of tofu, bananas, and almonds will give you one fat block, one carb block, and one protein block. 2. Frozen Blueberry Yogurt consisting of low fat yogurt, cottage cheese, almonds, fructose, and frozen blueberries will give you three blocks. 3. 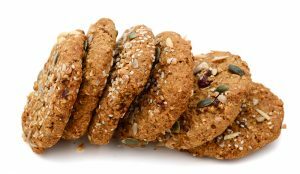 Almond Oatmeal Cookies will give you a block of protein, a block of carbs, and ½ block of fat. 4. Tahini Cakes are Zone Diet friendly when they are made using low fat cottage cheese, egg substitute, water, tahini, vanilla, oatmeal, and baking powder. 5. Pumpkin Custard is a great Zone Diet dessert for autumn when you combine canned pumpkin, egg white, olive oil, and pumpkin pie spice. Enjoy warm on a cool day. 6. Strawberry Shortcake is a popular dessert, and for good reason. Make it appropriate for the Zone Diet by using ingredients like egg whites, Splenda, white vinegar, vanilla, strawberries, and almonds. 7. Almond and Peach Soufflé is sure to impress when you combine corn starch, almond liqueur, eggs, Splenda, peaches, almonds, salt, and lemon juice. 8. Hotcakes are sure to hit the spot. Make them with eggs, cottage cheese, flour, and salt to keep it simple. 9. Cheesecake slices could give you two blocks of protein, two blocks of carbs, and a block of fat. 10. Chocolate Pudding can certainly be enjoyed on the Zone Diet when it’s made using simple chocolate squares and silken tofu. 11. Pumpkin Mousse is easily whipped together when you use milk, non-fat ricotta, canned pumpkin, almond, cinnamon, vanilla, cloves, and butterscotch pudding. 12. Strawberry Mousse is hard to resist, especially when it is made using Zone Diet friendly ingredients like frozen strawberries with no sugar added, natural cane sugar, Neufchatel cheese, cottage cheese, egg whites, and gelatin. With these dessert options, you will never get bored of your diet and you will always have something sweet and tasty to indulge in, even while you are working hard at eating right and losing weight or getting in shape.